好久不見! (Hao Jiu Bu Jian– Long time no see)! It really has been a long while since I wrote. To be honest, I don’t know where the month that has passed since I last wrote has gone. In fact, I don’t know where any of my time goes, because if you know me, I’m always busy somehow. So you’d think I could clearly provide an answer to a question I often am asked- “so if you only have 3 hours of school a day, what do you do with the rest of your time?” For some reason my answer comprising of key words such as “time sucking vortex”, “parralel universe”, “Truman Show”, “Wink if it’s true” does not cut it for most people. I guess everyone is the same right? We all have that precious 24 hours in a day, but somehow it’s never enough! I guess I can account for much my time last month considering I spent a lot of time catching up with new and “old” friends, finishing my first term of Mandarin, starting my new term yesterday, and a week holiday in Vietnam over my term break, and usually a couple of hours of day doing my assigned homework and cramming for weekly tests. I almost forgot I also took up belly dancing which takes up 2-4 hours a week. However it still doesn’t add up. I guess I’m failing to mention where a scarily large proportion of my time goes- trying to figure out my next move. I’ve spent countless hours looking for internships and volunteer opportunities here, sending resumes, attending networking events, researching post-graduate study options, networking and even attended a Toastmasters meeting to tackle my fear of public speaking! Finally, when it all seemed futile I got a bite at the end of my “quarter life crisis” fishing rod. I was asked to attend a recruitment day for an internship at a major international company. It came as a complete surprise as I’d just submitted an application for it without any confidence of it leading to anything. The day was incredibly interesting and I really enjoyed the challenges and working in a team of amazing people who have since become my friends. But despite doing better than I envisioned, I felt like I stuck out like a novelty fluro highlighter amongst a pack of sleek, impressive black felt tip pens. How could I possibly compete when I was amongst some of the most dedicated and talented business graduates- many with years of experience behind them? I was truly surprised and humbled when they asked me back for the second and final round of interviews. In a dramatic turn of events, I discovered (fortunately before the final interviews) that I couldn’t even do the internship due to stringent visa restrictions. Well, that was that sorted. However, I was left with a perpetual stream of questions to ruminate over. What did my willingness to so quickly give up my studies say my dedication to learning Mandarin? Was the prospect of working even what I came to Taiwan for? Would I have even been able to keep up with the other interns? Did it even matter anymore? Needless to say after the blow of losing that opportunity, my trip overseas couldn’t have been more perfect timing. However, when I returned for my first day of Term 2 yesterday, I found myself strangely unmotivated. Rather than make the conscious choice to be there as I had previously, it felt like it was something that was conveniently there for me to continue on from. I know this sounds ridiculous given how I’ve previously said how much I loved studying Mandarin. However, after having an incredible opportunity in my reach, only for it to be snatched away from me without my control, something changed. Once again, I felt like I stuck out amongst my peers. They all signed up for another term of study, not straying from their dedication, and there I was partly because I had to be because things didn’t work out. I truly don’t mean to be too theatrical about the whole thing, but I felt disingenuous because I wasn’t 100% committed anymore. However, today, over a bowl of noodles, I was able to find some of the motivation I’d lost. After arriving at my bus stop and finding that I must have just missed my bus by a couple of minutes and was in for a half an hour wait, I decided to grab some lunch at my favourite beef noodle shop. However, thinking I should be adventurous and try out a new place, I walked towards a noodle shop that I often ride past biking towards my school in the morning. The exterior was nothing flash, but had an enticing picture of a bowl of noodles from an article the store had been featured in. Positioned next to the door was a big signboard with a menu of noodles. Lacking just about the only thing I can read on a menu “牛肉麵” (niu rou mian- beef noodles) I was faced with a vision of characters I had no idea meant. After looking up a couple on my phone I realised it was silly to spend time looking up the characters and at best getting only a vague idea of what I’d be ordering. Dictionary in hand, repeating the new vocab of “seafood noodles” over and over in my head, I bit the bullet and entered the shop. Lo and behold I was the only customer, and a cheery woman greeted me. Here I go… “我要海鮮麵” (Wo yao haixian mian- I want seafood noodles), I said, somewhat doubting my own words. She took my order –phew- and I went to take my seat. At the last second I thought I should ask what their most popular dish was. She pointed her finger at the giant menu board inside, and told me the name of the dish. Greeted with my wide eyes, she said it again, and started explaining what the dish was. I had no idea what she was saying so I apologetically explained, “Sorry, I don’t know what you are saying, but, I want to try and taste it!”. She gave me a sympathetic smile and tried her best to think of a way to explain it to no avail. She took my offer to look it up in my dictionary. “Sour” was the word she was looking for. “Oh! Yes, that is fine!” I exclaimed, happy that we got there in the end. I sat down at a table and the woman stood next to me. She seemed really friendly so I started to strike up a conversation. She asked me where I was from, and I inquired about her life- how long she’d been working in the shop, if she was from Taipei, whether she had other foreign customers come in. After about 10 minutes of chatting my dish arrived. Wow. 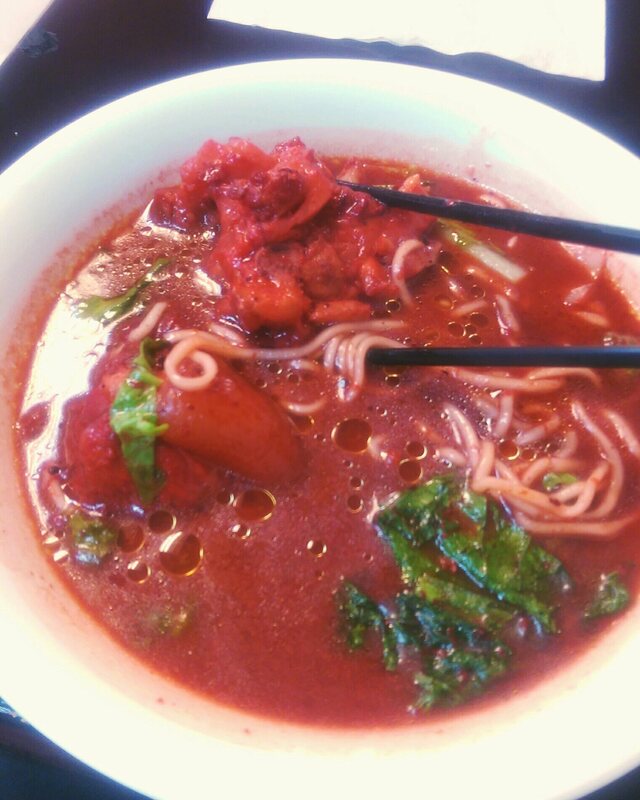 A bowl of bright red soup and two huge chunks of meat gleamed below my eyes. “It’s red soup”, she explained, pointing to its representative character on the menu, 紅 (Hong). Before I even took a bite we got chatting again. I’d never seen anything like this dish, and was so intrigued to learn more. “Do other restaurants have this?”, I asked. “No, only us.” She explained that is is a special dish from the Mazu Islands. I had to look it up as I didn’t understand where she was talking about. (I’ve since found out that the Mazu Island archipelago contains 19 islands that, are far closer to mainland China than to Taiwan, but are part of Taiwan politically). I asked her who taught her how to make the noodles, given she’s not from the area, and she said the previous owner had taught her. I asked her this and that and she was all too happy to answer. She was even kind enough to compliment me on my rusty Mandarin. So there we were chatting and chatting whilst my bowl of noodles remained untouched, waiting patiently to be eaten. Somehow I had managed to scramble my way through a conversation fully in Mandarin (although not without times of not knowing what she was saying!). I don’t know what was the bigger feat- surviving my first authentic conversation in Mandarin, or surviving my first experience of not scoffing down my food straight away. I felt reinvigorated from our conversation. Finally, I could feel the power of human connection which comes from sharing a language. All the hours, days and months I had spent studying seemed to have meaning. It wasn’t just reciting words on a page or the universally hated, “I have a pen”, which strangely seems to be the first sentence taught in many language learning situations. My humble and limited Mandarin ability allowed me to share a moment or two with a stranger. And whilst but a small feat, it was a timely reminder in a time when I feel a bit lost that that is why I am learning this language. So whilst my doubts haven’t magically vanished away, it’s comforting to know that this is all leading to something- if but another conversation with a stranger over noodles.